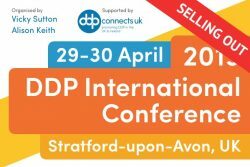 The 2019 DDP International Conference in Stratford-upon-Avon has proved extremely popular. Organised by Alison Keith and Vicky Sutton, with the support of DDP Connects UK, this two-day conference will run from 29th to 30th of April 2019. We have now sold out of the 2 Day Conference Package including Dinner, Bed and Breakfast. However, we have places available for the Two Day Conference without accommodation and the One Day Conference. There are a number of good hotels very close by to the conference venue Stratford Manor Hotel, Stratford-upon-Avon, who may be able to meet additional accommodation needs. More detailed information about the event schedule and conference packages can be found on the 2019 DDP International Conference, Stratford-upon-Avon event page and the event flyer below. If you would like to book either the Two Day Conference (without accommodation) or One Day Conference, please email Vicky Sutton at ddpconference2019@drvickysutton.co.uk.